If you have the impression that spelunking is the same as caving, think again. In fact if you say you are going spelunking in Alabama you may just turn a few heads in dismay rather than awe. All around the world those who explore caves safely, with the appropriate safety equipment and after the proper training, are called cavers. Those who head to the caves with a hand held flashlight and a six pack thinking they’re all hard are called spelunkers. Cavers rescue spelunkers. Don’t get the two mixed up in Alabama – trust us you don’t want to go there. 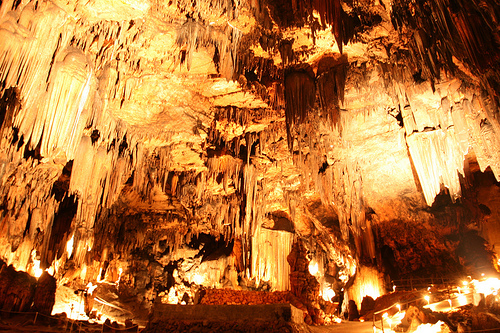 Native Alabamians know a lot about caving and when you see what their caving systems are like you will understand why. Firstly they have a lot of caves – not just one or two, a lot! The Alabama Cave Survey which records and charts the caves in the state recently estimated there to be at least 4,000 of them. Along with Georgia and southern Tennessee, Alabama is said to be one of the three states that can be called the caving capitals of the United States – this is a real hotspot for cavers and an amazing place to visit. Most people who visit Alabama to go caving are inexperienced and hence opt to visit the more commercial caves such as the Sequoyah Caverns or the DeSoto Caverns, or one of the state parks such as the Cathedral Caverns or the Rickwood Caverns. However these areas have lots of walking passages and are full of large, dry chambers which isn’t really what caving is all about. With the headquarters of the National Speleological Society being held in Huntsville, Alabama there are a whole hand of training groups in the state that can take you on more wild cave explorations provided you undertake the necessary training first. The wild caves in Alabama really are a sight to behold but they’re not as easily accessible and you won’t catch any spelunkers down there either – unless one has wandered off course and got lost so there is a rescue party going on. These caves are in their natural state so you can expect them to be wet, muddy and full of passages that will require you to crawl through them. Doing so as an inexperienced spelunker can get you killed hence the need for training and to go caving in Alabama with someone who has experience with the area. Most of the caves in Alabama are formed from limestone and this has led to many holes and even lakes being formed when the rainfall gets inside. This is what leads to flowstone formations. In both the commercial and wild caves you will see a number of flowstone formations including stalagmites, stalactites, draperies and columns. When you go on a commercial tour your guides will tell you all about what they believe the formations look like – this could be anything from sharks to US presidents however when you go in the wild caves you can let your imagination run wild and decide for yourself what the formations resemble. In addition to the formations that you will see you may also encounter some weird and rare creatures during your caving expedition. Bats and salamanders are just two of the creatures you may come across which is another reason why caving with an experienced Alabamian is such a good idea – you don’t want to do yourself any injury or worse, affect a habitat or an endangered species. Caving in Alabama can be an exciting extreme sport though be sensible and go with an experienced guide. And don’t even think about spelunking – it’s not cool in Alabama and true cavers won’t be impressed. This entry was posted in Alabama, Caving, Land Sports, Travel, United States and tagged Alabama, Caves, Caving, Caving in Alabama, Spelunking. Bookmark the permalink.